Location/Climate: 80 miles north-northwest of Ketchikan, 150 miles south-southeast of Juneau. 82"/yr. precip., 29°F57°F. Population: 2,758 (20 percent native, mainly Tlingit). Travel Attractions: Access to Stikine River and Stikine-Leconte Wilderness, Tlingit totems, Wrangell Museum, genuine Alaska. Getting There: Scheduled air service from Juneau; scheduled ferry service from Ketchikan, Juneau, and other points. Information: Chamber of Commerce, P.O. Box 49, Wrangell, AK 99929; Visitor Center, in the Stikine Inn 1 block from ferry dock, 874-3901, (800) 367-9745, chamber@seapac.net, www.wrangell.com. Open when cruise ships and ferries are in port, longer in summer. Wrangell is a working town with relatively little in the way of travel attractions. It claims to be the third-oldest Alaskan community, the gateway to the Stikine River, and the only Alaskan town to have been ruled by four different nations: Tlingit, Russia, Britain, and the United States. Tongass logging, commercial fishing, and fish processing occupy most of the work force, while others are involved in mining transshipment and tourism. Those staying in Wrangell can enjoy a friendly, working, genuine Alaskan town with local attractions including short hikes and a history museum. One interesting feature of Wrangell is the garnet business, engaged in by local scouts. The Boy Scouts of America own Garnet Ledge, a formation about 8 water miles from town at the mouth of the Stikine River where garnets are found in abundance. A reservable Forest Service cabin near the ledge is one of six such cabins found at the mouth of the river. 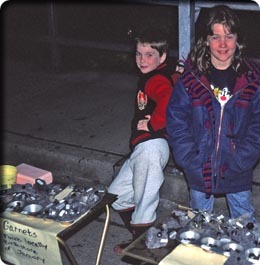 The scouts and their siblings sell garnets at the ferry terminal. Wrangell is a good base for visits to the Stikine-Leconte Wilderness and Anan Bear Observatory. The 18-mile Zimovia Highway runs a third of the way down the west shore of Wrangell Island and links to national forest roads that wind across much of the island. A few short area trails lead to lakes and overlooks. The local summit of Mount Dewey can be reached by a steep, half-mile trail from 3rd Street. Anan Bear ObservatoryThe Anan Creek Trail (.5 mile) follows Anan Creek from Anan Lagoon to the observatory where black bears feed on spawning pink salmon (humpback salmon or "humpies") in July and August. Brown bear and bald eagles may also be seen, and seals frequent the lagoon. The observatory is staffed from mid-June to mid-September; no reservations necessary. Anan is about 30 water miles southeast of Wrangell at the head of Bradfield Canal. Access is via floatplane, sea kayak, or charter boat (see the Appendix). Check with the Wrangell Ranger District office for current schedule and information, 525 Bennett Street, 874-2323. They also have information on reserving backcountry cabins at Anan and elsewhere in the district. Petroglyph BeachHead north from the ferry terminal on Stikine Avenue a little more than half a mile to reach a small parking area and access to the shore. A boardwalk provides access to several good petroglyphs that face the water above the high-tide line. The carvings are of unknown origin, but may date back 8,000 years. Shakes Island and Tribal HouseAt the south end of Front Street near the floatplane harbor, a boardwalk leads out onto Shakes Island. There are several fine totem poles here, as well as a replica of a tribal house with interesting artifacts inside. The site is listed on the National Register of Historic Places. Open irregularly in summer; call for hours or drop by, 874-3747. Wrangell MuseumRegional heritage exhibits and artifacts are found at this museum, just down the street from the ferry dock. 318 Church Street, Wrangell, AK 99929, 874-3770. Open weekdays 10 a.m.5 p.m., Saturday 1 p.m.6 p.m., Sunday when the ferry is in port; $2, under 16 free. Diamond C Cafe, 223 Front Street (at Thunderbird Hotel), 874-3677. Family menu; daily breakfast and lunch. Stikine Inn, 1 block from ferry terminal, 874-3388. Motel, restaurant, chamber of commerce, Stickeen Wilderness Adventures, on the water, rooms range from $70 to $100. Thunderbird Hotel, 223 Front Street, 874-3322. Basic motel. Wrangell Hostel (First Presbyterian Church), 220 Church Street, 2 blocks from the ferry, 874-3534. Only hostel in Wrangell. $10.